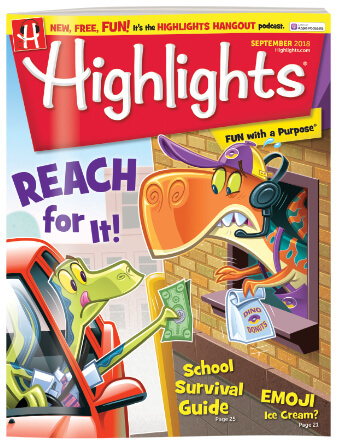 Highlights has been the most trusted name in children's publishing for more than 70 years! Our childhood experts know what kids like and how to keep them engaged in fun and learning. Plus, reading beyond what's required for school boosts kids' skills in all subjects. The Highlights motto is Fun with a Purpose™. In every 44-page issue, kids explore new topics, investigate fascinating subjects and find out about the world. A Highlights magazine subscription for kids will bring them 12 months filled with stories, games, puzzles, riddles, science experiments, craft projects and activities that are as entertaining as they are educational. Plus, HIghlights never includes third-party advertising, which means it's a commercial-free zone where young readers can play, learn and just be a kid. One of the founding principles of Highlights is to help kids become their best selves: Curious, Creative, Caring, and Confident™. That’s why we keep up with the interests of kids today, while upholding time-honored values like respect, manners, fair play, kindness, honesty and more.